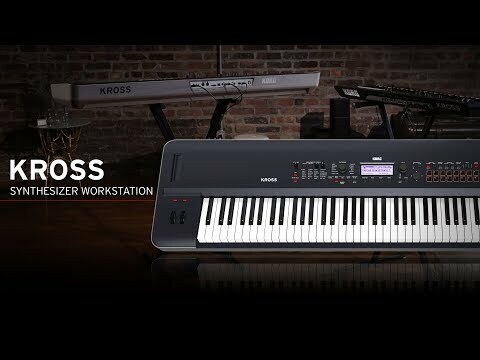 Product Overview The KORG KROSS 61-key model, popular for its class-beating performance and stylish design, is now joined by new models in a variety of colors. The lightweight body that makes the KROSS so easy to transport is a perfect match for the four new neon colors: green, orange, red, and blue. KROSS 2-61, the long-awaited successor of the KROSS, is a compact, portable workstation with a huge range of sounds. While maintaining its identity as ultra-lightweight, compact, and capable of running on batteries, this new model dramatically enhances KROSS’s sounds and functionality. In addition to a total of more than a thousand preset sounds, expansion PCM memory has been newly added. Also new is a pad sampler that allows full-fledged sampling, and USB audio/MIDI interface functionality. The colour scheme is even more stylish, and the user interface allows intuitive operation even by beginners. The evolved KROSS 2 also features high quality in its body finish. First, the 88-key model uses a stylish and cool “dark blue” colour. The 61-key model uses a “super matte black” colour with a high-quality rubberized finish that is durable and feels great to the touch. Lavish use of this sophisticated rubberized finish gives the instrument a highly professional appearance. The 61-key model is additionally available in a limited-edition “red marbled” colour. The special marbled red finish is unique and different on each KROSS 2 unit. 16-track MIDI sequencer - The 16-track MIDI sequencer records your keyboard performance and controller movements as MIDI data. It can also record your pad sampler performance, providing an easy way for you to create sketches of ideas for songs. Step sequencer -This lets you use the 16 pads to intuitively and quickly create original rhythm patterns of up to 64 steps. Drum track -The drum track lets you add rhythm to your performance simply by pressing a button. Choose from 772 preset drum patterns that cover a variety of styles. Arpeggiator - This function is a great way to generate ideas for songs; simply hold down keys to generate rhythmic chords, bass phrases, or guitar strumming. A dedicated KROSS2 Editor and Plug-In Editor are also provided. These let you edit while viewing numerous parameters at a glance on your computer, or allow you to use the KROSS 2 as a software synthesizer from within your DAW. Features • A rich selection of more than 1,000 powered-up presets. • 128MB of expansion PCM memory is built-in, and option libraries are supported. • The rich expressive power of the EDS-i sound engine, and a rich selection of effects with 134 types. • Superb sampling functionality and 16 sampler pads. • A panel layout that lets you access functions without confusion. • Realtime control section for quick parameter editing. • Favorite function lets you register and instantly recall up to 128 frequently-used sounds. • Quick layer/split can be specified by a single button. • Ultra-lightweight compact body; the 61-key model weighs only 3.8 kg, the lightest in its class. • Long operating life, with six AA batteries allowing up to seven hours of use. • A colour lineup with a peerless finish that exceeds its class. • Audio player/recorder that can be easily triggered by the pads. • Sequencer, drum track, and arpeggiator to support your song production. • A rich array of input jacks for singer-instrumentalists or vocoder performance without requiring additional equipment. • Also functions as a USB audio interface.